Newport Beach Police Department sent out an alert Monday about two recent residential burglaries. The first occurred at a home in Harbor View Hills South, in the 1300 Block of Keel Dr., between: 1:45 p.m. and 4:10 p.m. on Jan. 31. An unknown suspect came onto the property through a side gate while the victim was out for the afternoon. The suspect removed screens from bathroom and laundry room windows to attempt to get inside the house. “The suspect then smashed the laundry room door window, reached through the broken window, unlocked the door and entered the residence,” the NBPD message explains. The second home burglary happened on Rue Villars in Big Canyon, between: 5 p.m. and 9 p.m. on Feb. 1. The suspect climbed over the fence from the golf course and into the backyard of the home while the victim was away for the day, according to police. “The suspect then shattered the rear sliding glass door to get into the house,” the message reads. In both cases the suspect ransacked various drawers, cabinets and closets throughout the house and then fled in an unknown direction. There was nothing determined to be stolen at the time of the report for either incident. Police also used the message as an opportunity to remind residents to report any suspicious activity at a home if the owners are known to be away on vacation, out for the evening, or if the house is for sale. 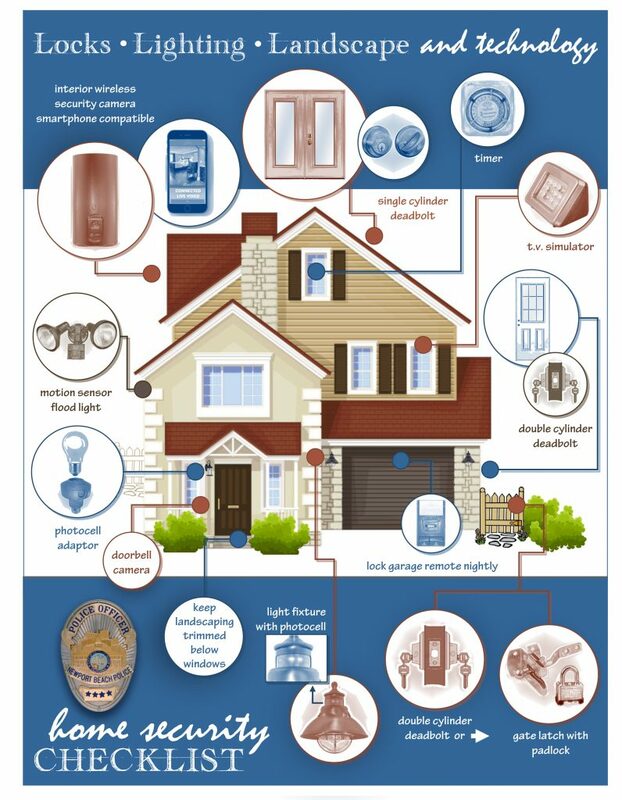 Authorities also shared some home security tips, including always lock windows and doors when going out, even if for only a few minutes and always activate the alarm it even if only going out for a short walk. When leaving on vacation, remember to call NBPD for a “Vacation Check” at (949) 644-3681.